how many cameras does it take to photograph the Salton Sea? aside from the birds, and some scattered humans, it is the Geothermal plants that seem to be alive in the Salton Sea. the way the internets taught us was: 1. buy a full-frame dSLR; and, 2. take it everywhere. in some ways, the times that I have taken the big dSLR, and the assortment of lenses to the Salton Sea, the results have been good**. there are many lenses, which is the versatility needed when visiting the Salton Sea, for one never knows when the "mud" (a mix of gunk, water, soil and fine grains of fish bones) will make one say 'ok, this is good enough'. consequently, this means wide angle lenses and zoom as big as one can carry. the favorite spot remains the trees at the Red Hill Marina area, which, by the nature of the messy shoes and stink of sulfur, remains rather free from visitors. this is the first time that I get this far. for other reasons, one may want to bring Medium Format cameras too, which for most of us, it means that film and multiple cameras are required. over many visits, the cameras have included: Canon EOS3 & 5Dmk2, Olympus EP-1 & 3, Fuji XPro1 & X20, Mamiya 7ii, Hasselblad, Graflex, Polaroid 280, and a Rolleiflex. most of the Medium Format cameras have but one lens — fixed or that is what it is. with an interest for the Medium Format, which means 2 or 3 cameras, then the Canon system stays home, as it has been the case for the good part of the last 3 years. the versatility of the Fuji and the desire to travel just with checked-in luggage, means that it is the digital camera to bring. (I forgot the digital pinhole camera this time.) oh yeah, and a suitable tripod is quite needed too, and to be able to bring a small tripod, then that means that the Mamiya and Rolleiflex are the ones possible in the Medium Format size. there is colour in the Salton Sea, beyond the yellow and blue, and all shades of beige. a variety of Mexican restaurants will provide such a treat. right? a photograph becomes a word (if real good!) or a syllable, when it is decent. then, there are the conjunctions-functionality photos. if the sentence ends up being poetry, then, a smile is earned. the abandoned of anything that burns, or simply was used once for a store, because a signature of the transformation (and evolution) of the Salton Sea. windows within windows into decay, as such is the layer of time.
" shootin' " and using the cameras are quite fun things to do in the Salton Sea, and to take a good photos is quite easy: one has not seen anything like it before, and it is going to be totally awesome. however, wanting to make something cohesive of the location is quite a challenge (to me). while the photos taken with the phone may be processed in a "heavy handed" fashion, because, hey, it is good to have fun with fakery of looks, there is a message to signify which locations and compositions worked well by how the phone photos worked. ** those photos are no longer online, since all socio-photo sites have been deleted. however, the other day, I found that fotoblur's simple portfolio still exists. one has to go through many pages to see all of them. enjoy that! 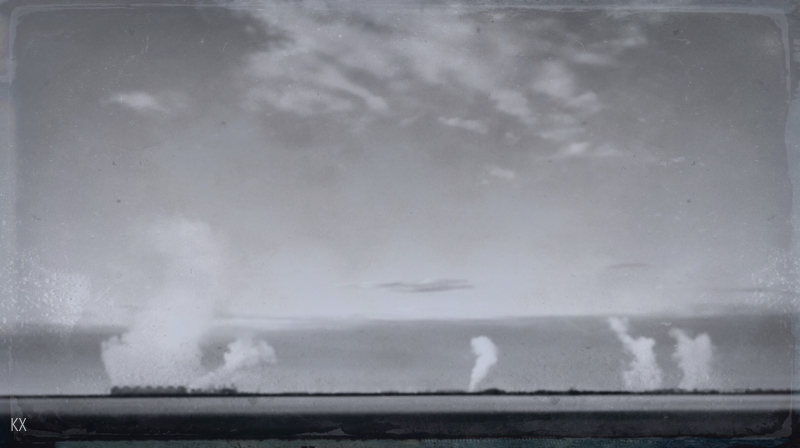 however, the Salton Sea photos should stand out to the eye trained from the photos above [ link ]. other photos can still be seen at Dunked [ link ], which are of the pinhole variety.